A vintage purse is a signature piece that can be worn alone or as part as a coordinated outfit. A one-of-a-kind purse is fun or you or as a one-size-fits-all gift. 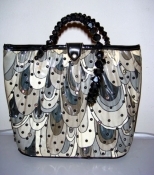 Groovyjuice.com carries a unique selection of handbags, bags, purses and carrying cases.